Venus (gk. Aphrodite), like Mercury, is an inner planet in close proximity to the Sun. Of all the planets (aside from the Moon), Venus’ phases are most apparent. Over the course of 18 months, an observer will notice that Venus oscillates in brightness – for nine months it waxes brighter and brighter in the sky, and for nine months it wanes. The intensity of Venus in the sky during its period of brightness resulted in this planet also been known as Phosphorous by the Greeks, and Luciferous by the Romans. Since Venus is one of the two inner planets it orchestrates a unique pattern in the sky. 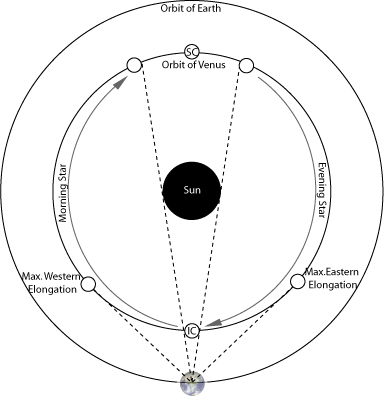 The planet vanishes from the sky twice in its 584-day cycle; the short Inferior Conjunction when Venus is in front of the Sun, and the long Superior Conjunction when it is behind the Sun (IC and SC in the diagram below). The complete cycle takes approximately 584 days (583.9). Like Mercury, past astronomers (particularly the Aztecs and Maya) measured the cycles of Venus against greater periods of time. The most basic Venus::Sun ratio is 5 Venus cycles every 8 solar years. Yielding a 2 day error, the 5/8 ratio holds true, but is nowhere near to the precision of the Mercury::Sun ratio. Within the Venus::Sun cycle we find that the locations of Inferior Conjunction (or Superior Conjunction, or indeed any fixed reference in the Venus cycle) when plotted in an ecliptical chart produces pentagonal geometry. As an example we will plot five consecutive Inferior Conjunctions of Venus between 582BCE and 576BCE. The precision is remarkable. Any point in the Venus synodic cycle plotted at 584-day intervals will produce the pentagram. The next conjunction cycle (begins 30May 574BCE) will produce a similar pentagram only turned about 2 degrees clockwise and so forth. Of particular interest is that while the Sun::Mercury ratio gives us an approximation of Pi, the Sun::Venus ratio produces the first two digits of Phi (1.61803398…). Furthermore, the pentagram produced by Venus’s conjunction cycle in ecliptic astronomy is a geometric expression of Phi as the ratio of line segments are all based on Phi. The Golden Mean, or Phi, is found everywhere from the spirals of a nautilus shell to the proportions of the human body and even in the geometry of our DNA. Phi is rhythm; it is a mathematical harmony that describes the repeating geometries of various universal forces. It is the ordering principle behind otherwise chaotic forces; and we see the evidence of this order in the spiral shapes and proportions we have come to associate with the Golden Mean. As a transcendent irrational number, Phi is to be understood as a manifestation of the Shekhinah/Sophia principle, or the omnipresent divine feminine that slithers throughout the Cosmos and propegates the beauty of the Golden Mean. I thought about starting my own blog too but I’m just too lazy so, I guess I’ll just have to keep checking yours out. …you can spot venus in the early evening and in the early morinng!Doesn’t that depend on which hemisphere you’re in and how far from the equator you are?Because there is isn’t a transit this year Venus must be passing either north or south of the Sun (north this time, I gather from other reports). To see it in both the evening and the morinng you need your local horizon to cut the line between Venus and the Sun in opposite directions at each time.I suppose if we were just before the equinox rather than just after then somebody at the north pole could observe Venus continuously (it would effectively be circumpolar for them). Venus is both morning and evening star, but not at the same time. It takes about 300 days for the planet to go from appearing in the eastern horizon before the sun (morning star) to appearing in the west after the sun (evening star).